As a proud member of the MPM Bee Owner Club, I can attest that he's pretty great. My only gripe with the figure is the paint don't really feel shiny and "rich" as on a real car. My Costco Gold Battle Ops Bee still feel look more "premium". But I gotta admit that seeing and feeling all that METAL in MPM Bee is SAH-WEET as hell. BTW, I only transformed him once, from car to bot. Without instructions, remembering the multiple video reviews. I've yet to turn it back. -Kanrabat- wrote: But I gotta admit that seeing and feeling all that METAL in MPM Bee is SAH-WEET as hell. I think that's what I liked most about him too. And Optimus (even though I've barely handled him). One of the biggest releases this year from Hasbro is the Toysrus exclusive Movie Masterpiece MPM-3 Bumblebee. While he has been found in the US, not everyone has a toysrus nearby and the toy has been selling like hotcakes. But now, everyone who wants one can get him since he is now available on Toysrus.com. Shipping is free for this toy. Will you be getting him now that he is readily available? If you are interested but want to see more before deciding, you can view our extensive gallery by clicking here. Motto: "I'm real when it's useful." Now to save up or try and get this and Prime while I still can. The fan film is on hold. I'm doing the logical thing and making the poor man's Robot Chicken with my TFs and other toys. My G1 Starscream needs fists. 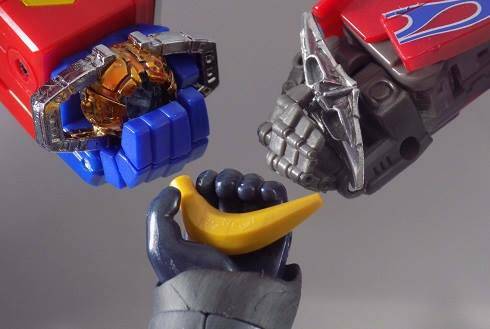 He's the Collection reissue and can't have a coronation without fists! Dang, 4 masterpieces available at the same time, I hope I can get them, but considering my small allowance, I will probably only get mp-10 with the help of my dad. As the newest member of the MPM Bee club, I have to say: he is really good. The metal is sweet! It adds heft that I was not expecting! The wings are finally done right, and the legs are a marvel with the fact they got the wheels in there complete with ankle tilt! He does look really good. I've transformed him several times, and the only gripe I can claim to have is his hands. The thumb is really throwing off his ability to hold anything, and it makes his hands flipping back into his arms difficult. His thumbs needed some extra movement. Oh and he looks great with that hammer accessory that some 3P company put out. I can't remember what it is, I bought it 3 weeks ago. But with a blaster in the right and a hammer in the left, he looks like he's ready to sting like a bee! I've already got mine off of eBay but it came with quite a ding on the metal part of the head. Motto: "Are you telling me you could've been a Camaro this whole time?!" Finally recieved my Masterpiece Bumblebee in the mail today and he is without a doubt my favorite Transformers figure. Absolutely love him. Ill have full thoughts and pics later, but he's awesome! EvasionModeBumblebee wrote: Finally recieved my Masterpiece Bumblebee in the mail today and he is without a doubt my favorite Transformers figure. Absolutely love him. Ill have full thoughts and pics later, but he's awesome! I love it too, but I HATE transforming him back into a car. Those legs panels are such a PAIN to align properly. 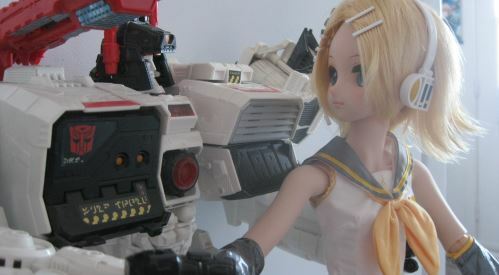 So, like i mentioned earlier, MPM Bee is awesome. One of the things that surprised me was the shade of yellow that they used for it. Based on pictures and what people were saying, I was expecting a really bright shade of yellow like the T30 Deluxe Bumblebee. Thankfully, this isn't the case. It's a much better shade of yellow that does look a little off in vehicle mode (but not enough to bug me), but looks spot-on in robot mode. The other major thing I was worried with for this figure was the part of the head that includes the logo and the antennae (which is actually die cast, i'm fairly certain) appears to sit on top of his head rather than be integrated with the rest of his helmet like it should be. This was really glaring in the pictures for me, but in person it looks just fine. MPM Bee is also my first Transformer with articulated fingers (HA Leadfoot doesn't really count), which is SO much fun for posing. His thumb could really use a swivel, but it's not that big of an issue. The paint is superb, they even have the month painted on his license plate. They also finally painted the black details on his shoulder armor, which I've been doing to my own Bumblebees for some time now. The only paint I could think to add is a little bit of yellow on the side tabs that hold his torso in place and a darker orange in the Plasma Cannon barrel. Speaking of the Plasma Cannon, I do like it, but I wish it was integrated into his arm and not a separate piece because I am terrified of losing it. Still looks good, though. Transformation is good, I love how the entire top of the car folds into his chest, it's a creative way to get rid of the backpack that many other Bumblebees have. The only trouble I've had with transformation so far is figuring out where to put the heel spurs as you transform the legs, but after figuring it out it's not that big of a deal. I will say that I didn't find the instructions very helpful, as they didn't show specific steps, it just kind of gives you a general idea in the direction parts should be moving. Vehicle mode is great. it rolls smoothly and again the paint is fantastic. Everything down to the rear view mirrors and windshield wipers is painted. Overall, MPM-3 is a fantastic figure which I totally recommend. He does have a few flaws, such as a balance problem and insecure tabs in his feet, but the good far outweighs the bad in a figure that certainly earns the title of masterpiece. 100% agreed, that shade of yellow was perfect. This is what I want out of Movie MP figures. Pitch perfect rendition of Bee, couldn't be happier with it! Wish more time had been taken with OP, this one proves they can do it right. ScottyP wrote: This is what I want out of Movie MP figures. Pitch perfect rendition of Bee, couldn't be happier with it! Wish more time had been taken with OP, this one proves they can do it right. They did take their time on prime. Thanks to a heads up from several of our site sponsors, we have word for you that the highly popular MPM-3 Bumblebee figure is getting a reissue! 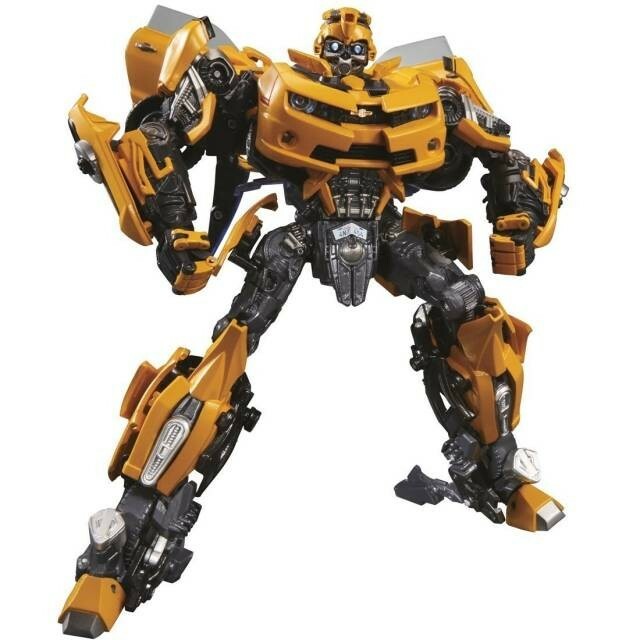 MPM-3 Bumblebee was released in the summer of 2017 by both Takara and Hasbro, and was popular enough that it has kicked off the Movie Masterpiece line in earnest. The figure is based on his 2007 Movie appearance, and features a highly detailed and posable robot mode with a great car mode, and comes with his signature blaster and deployable battlemask, which does not require any face swapping as it's integrated into this head. You can find the pre-orders for the reissue below from our sponsors. Let us know what you think of the news of a Movie Masterpiece reissue! Did you miss out and are looking forward to obtaining this guy now? Let us know! NOTE: This post will be updated as other Pre-Orders are put up on their respective sites! 4,702 pages were recently viewed by 1,040 unique visitors. This page was viewed 1 times on Sunday, April 21st 2019 3:29pm CDT. © 2019 Seibertron, Inc. DBA Seibertron.com. All Rights Reserved. Established June 2000. Seibertron.com is owned by Ryan Yzquierdo.